Need more information about booking Home 138128 ? Upon entering Serenity Villa, you are instantly presented with spectacular sea views framed in the large floor to ceiling windows and sliding doors. Serenity is luxuriously appointed throughout with a large, open planned, split level living area and modern, sleek, granite topped kitchen. The contemporary, open plan living area opens out to the beautiful marble patio with large HEATED* infinity pool and Jacuzzi, perfect for the early and late season months when the weather is hot but the pool would be cold! Serenity is designed over 3 floors with air conditioning throughout and sea view balconies to each bedroom. Each bedroom is designed with luxurious en suite wet-room showers, additionally the master bedroom has a free-standing, contemporary bath overlooking both bays. Serenity is as luxuriously appointed outside as it is inside, having a fabulous marble patio area on two levels with a large infinity pool and 10 person capacity jacuzzi, all with unobstructed views of the sea and islands: The pool and jacuzzi can be heated for an additional cost, we also have an new ottoman style outdoor seating area and a table tennis table. There is also an outdoor shower area and fully stocked gardens to 3 sides including beautiful climbing Bougainvillea, fruit trees and Mediterranean flowers; the perfect setting for a relaxing holiday.The villa is fully air-conditioned, complete with free wi-fi. There is a large, gated carport for one car as well as additional parking spaces outside the property. The villa has an external CCTV system. The pool and outside areas are cleaned daily with towels and linens changed twice weekly. Kalamar beach club and the picturesque town of Kalkan are a short walk away. *Pool can be heated for a small cost - perfect for the early and late season months where the weather is perfect but the pool can be cold. The open plan lounge contains 2 large L-shaped sofas, contemporary built in log burner and 40" LED television with satellite channels, Wii and DVD player plus Ipod/iPhone speaker dock. Sliding doors open out to pool area taking in the stunning, unobstructed sea views. WIFI is now also available throughout the villa.The kitchen is superbly appointed with large black glass, fridge freezer, microwave, oven, hob, dishwasher, watercooler and gloss white units with black granite work surfaces. There is also a black granite topped dining table with six chairs. A wall of glass opens out to the raised patio area with an additional alfresco dining area making this the ideal villa for relaxing, entertaining and enjoying the stunning views.There is also a utility area with washing machine and separate toilet.Stairs from the kitchen lead up to the large, first floor bedrooms. Bedroom 1 has twin beds which look out to the amazing sea views and a dressing area with built in wardrobes which leads to a sea view balcony. The room also includes an en suite wet-room area which houses a luxuriously appointed shower with modern fittings. Bedroom 2 has a King sized bed with dressing table and built in wardrobes, 32" LCD TV and DVD. Floor to ceiling glass doors open out to a balcony with spectacular sea views and table and chairs. The bedroom is also appointed with a luxury en suite wet-room with rain-shower. The whole of the top floor is dedicated to the split level, master bedroom suite. There is a large dressing area with built in wardrobes, modern super-king-size bed and a large, flat screen TV with DVD. Floor to ceiling glass walls and door lead out onto the large roof terrace. Marble stairs direct you up to the en suite bathroom and shower area. The focal point is the contemporary, free-standing, designer bath which overlooks the whole of Kalkan and Kalamar and the breathtaking views. High quality, Egyptian cotton linens are included as well as towels for both bathroom and poolside. Stepping outside Serenity you will be presented with the most amazing sea-views whilst still retaining your sense of seclusion in private grounds. Serenity also benefits from the highest quality, contemporary outdoor furniture including designer rattan sofa set with table, 6 rattan sun-loungers with deep cushions and umbrellas. There are sliding glass doors which bring the inside out, leading to a rattan dining table with 6 chairs for alfresco dining. New for 2015, we have a covered ottoman seating area and a table tennis table for the more enthusiastic guest. A barbeque is also available for those of you who can resist the lure of the amazing dining experiences to be found in Kalkan.There is a place for everyone so you can relax and find your own personal space to admire the views or unwind with a book. The villa was amazing. Excellent pool - as good as the photos - and very high quality fittings within the villa. Daily visit from team to deliver bread and check/maintain the pool area. We had a problem during our stay for which the local agents gave immediate excellent support. The villa itself is set at the back of the town which makes it quiet with fab views. You can walk into town- but the roads are steep and the quality of the roads is not great- i would recommend a torch and good footwear- or get a £3 taxi! Food in Kalkan is great- one place, Samphire, had a problem with their card machine- having never met us and without as much as taking a name, they just asked us to bring the money the next day. Patara beach, Lycean and Roman sites are a must! Serenity Villa did not disappoint, beautiful inside and out with the most amazing views. Seamless from the point of booking to departure thanks to the owner of Serenity. Would defiantly recommend staying here. Car advised for the less able however it is walkable to Kalkan town where you will find plenty of restaurants to choose,Trios was one of our favourites. Kalkan residents were friendly and shop owners did not hassle for a sale all in all a wonderful stay and will defiantly will return. My wife and I booked the property for a week with our friends (2 couples), having stayed in Kalkan previously and been visiting for years myself. From the moment we arrived at this property to the unfortunate point that we had to leave, we were blown away!! The views were amazing, the property itself more than satisfied all hopes and expectations, with great facilities, decor and in excellent condition (no signs of the fact that it is a rental property). We were met with a fantastic welcome from Billy (fluent english speaking, great guy!!) and his very pleasant colleague (I think it was Ali). All of our needs catered for, including a wonderful welcome pack. Fresh bread was brought daily and the pool cleaned. Given the fact that we enjoyed our time at the villa so much, we didn't really want to venture out too much on day trips, etc... But everything is accessible and the walk into town is not far at all. Kalkan itself is such a hidden gem, with excellent shopping, cuisine and a nightlife that is just right. We all had such a fantastic time and apologies it took so long to put the review on (not sure where the last 3 months went!!). Thank you again so much and we hope to return soon. The villa is superb with amazing views. It is very well equipped and truly luxurious. We found the area had plenty to do with trips and beach clubs as well as spending time by the villa pool. Something for everyone. Villa Serenity is absolutely breathtaking. Each room is pristinely clean and beautifully decorated. The bedrooms all have massive glass picture windows that overlook the pool and jacuzzi and the amazing view of Kalkan. If i could have stayed forever i would have. 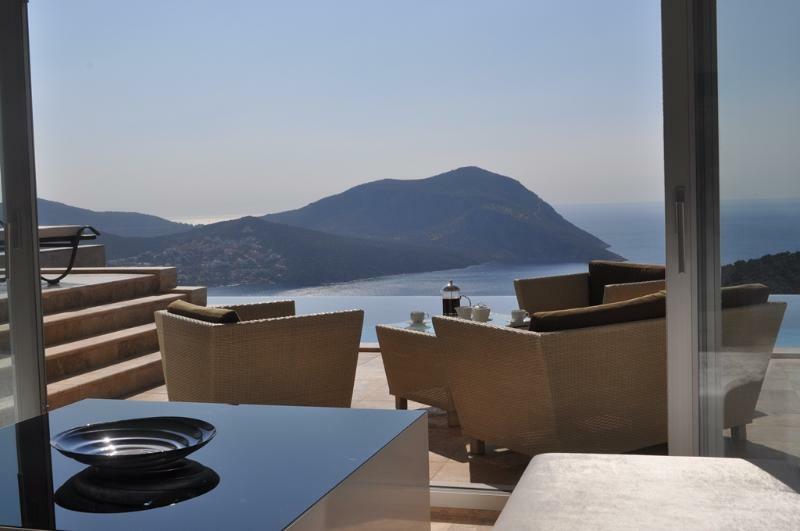 I have visited a number of villas surrounding Kalkan and this surppased them all. A perfect holiday home. A superb villa with a view to kill and brilliant facilities. The infinity pool and jacuzzi were great places to sit and reflect. Kalkan is a great family location with plentiful restaurants and the friendliest people. A day on the boats is recommended with the Yildiz seemingly one of the real favourites. All in all - heartily recommended for families and we'll be back. The villa is exactly as it states in the literature. The views are amazing and the villa itself is fitted out to a very high spec the pool is just beautiful. We could not fault it at all we had a wonderful and very relaxing time - its the only place I've ever sat in the bath and had such an unbelievable view! The owners were very helpful and accommodating and organised. The transfers to and from the airport were excellent and very comfortable and the car we rented great although you must be able to do hill starts! Kalkan itself is a great place as well, relatively unspoilt by touism and great restaurants, we particularly liked Doy Doy and Salt & Pepper. We can't wait to go back! It was a perfect location with beautiful views. Accommodation was luxurious, immaculate. Comprising of everything needed for a relaxing holiday. Help was always available whenever needed. Two beautiful clear pools with idyllic views, cleaned daily. There was an ideal selection of sports equipment at hand for use. It was reassuring to know throughout the stay that any queries could be answered. Wonderful relaxing holiday in a most luxurious villa situated overlooking the Kalkan bay coastline in an extremely desirable part of Turkey. The villa itself and the interior furnishings were of extremely high quality standard. Very clean,modern and obviously well maintained. To lounge in the pool or lay back in the jacuzzi with views of the sea was amazing. All the trappings of a sophisticated holiday. The villa is named "Serenity" and it lived upto its name. Place to revisit without doubt. You can get in touch with Tracy (the owner) through the contact form on this page. Send Tracy (the owner) an email through the contact form on this page. Alternatively, if there’s a phone number on this page, you can call them. How do I contact Tracy (the owner)? You'll need to send Tracy (the owner) an enquiry to book - the owner will let you know how to pay. If they accept online booking they'll send you a quote and info on how to pay. If you pay through our website you’ll be covered by Payment Protection. Or you can send Tracy (the owner) an enquiry through the contact form to request a quote. Tracy (the owner) will email you the total cost for your dates and how to pay. Send Tracy (the owner) an enquiry through the contact form requesting a quote for your holiday dates. Tracy (the owner) will email you the total cost for your dates and how to pay. Tracy (the owner) of this property is responsible for taking and refunding your damage deposit. The damage deposit terms should be agreed before booking and outlined in the booking contract, if Tracy (the owner) supplies one. Please refer to these details or contact Tracy (the owner) directly if you have any questions. You'll need to contact Tracy (the owner) to cancel. They should have provided their contact details when you made your booking - otherwise, email them through the contact form. You'll need to contact Tracy (the owner) to edit your booking. They should have provided their contact details when you made your booking - otherwise, email them through the contact form.